As I’ve previously mentioned, most wine shops [at least the ones where I live] don’t usually carry a selection of Pinotage, therefore I pick up a bottle whenever I happen to stumble upon it. 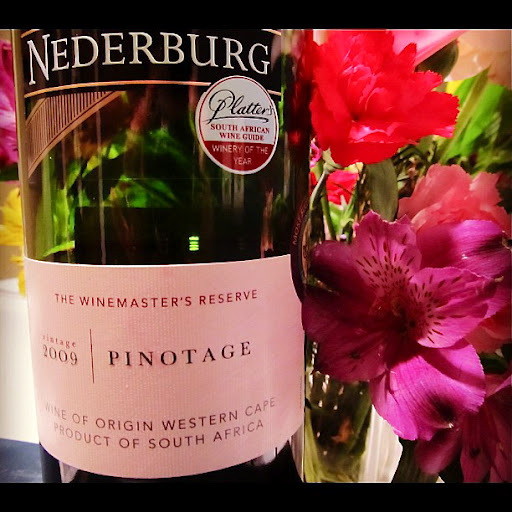 After surveying the accolades on the Nederburg Winemaster’s Reserve Pinotage 2009, I was quite enthusiastic to give it a pour. Platters South African Wine Guide name it “Winery of the Year”, whilst in 2009 it won the “Most Successful Producer” award at the Old Mutual Trophy Wine Show. Raspberry-garnet in colour, after aerating aromas of flint and warm cedar rose from my glass. Although the medium body possessed fruity plum, stony minerals and oak notes, the overall taste was somewhat muddled and shadowy. Thankfully, the lengthy finish jumped in and saved the bottle. Spicy black pepper and smoky campfire elements were embraced by a delectable earthiness. In spite of the fact that I found it to be somewhat flat, the general smoothness and substantial, pleasant finish were able to produce a fairly agreeable glass.